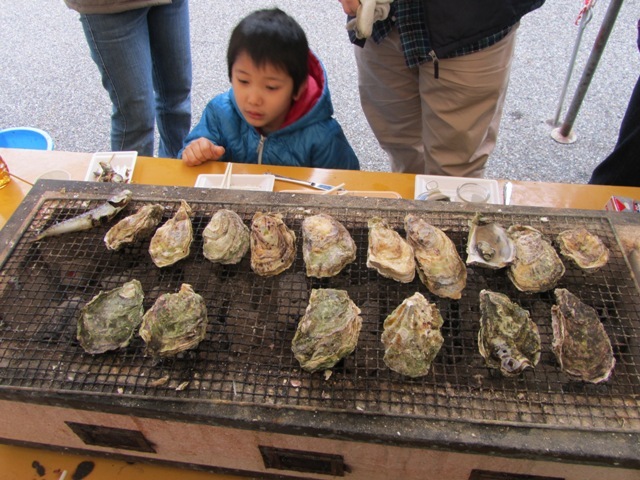 Oysters have been eaten by people since prehistoric times, but I’ve always been wary of them. I blame this on an episode of Mr Bean I saw when I was young, when he gets food poisoning from eating oysters and then has disturbing hallucinations. As of yet, I’ve never eaten raw oysters, but now that I’ve been converted to the cooked variety, I’d be willing to give them a try. 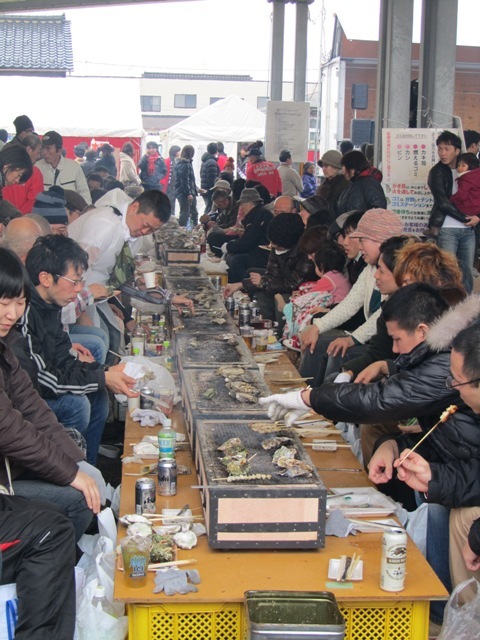 Anamizu is a small town in the rural peninsula of Ishikawa prefecture, but it comes alive every January for its annual oyster festival. 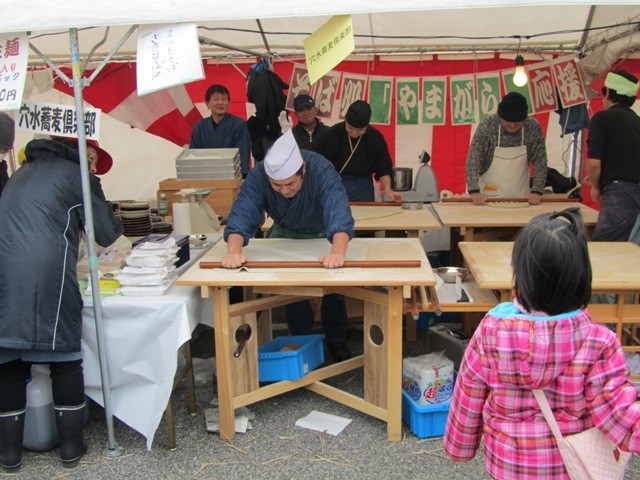 I was surprised at how large the festival was. 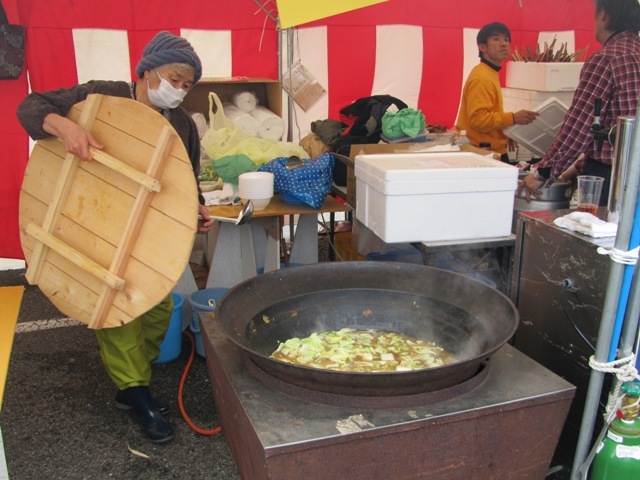 All around the edge of the festival area were stalls selling festival food. 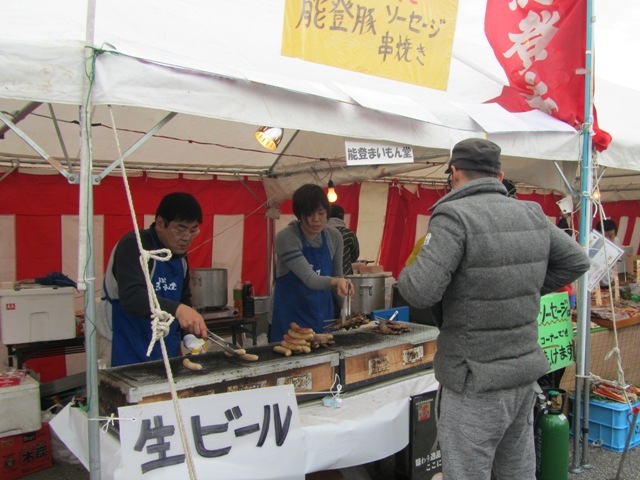 There were the usual suspects of ramen, yakisoba etc, though many of them involved oysters in some way. 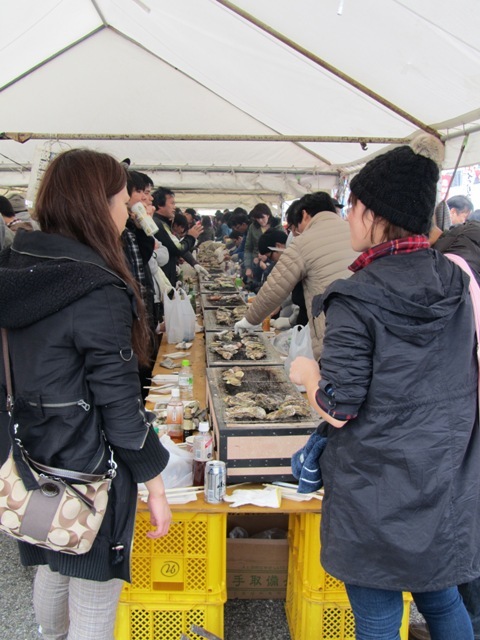 At each end of the space were the stalls where you could buy your own oysters, ¥1000 for a plastic bag of 10 or 11. 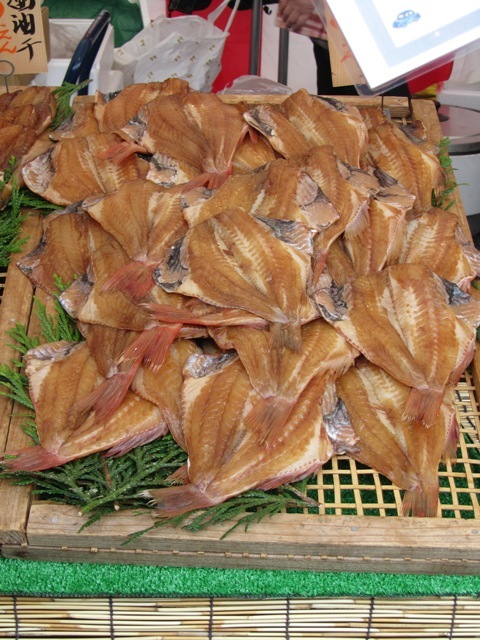 In the centre were two long covered areas with grills where you could cook your oysters or whatever else you had. One area was standing only and the other area had seats. 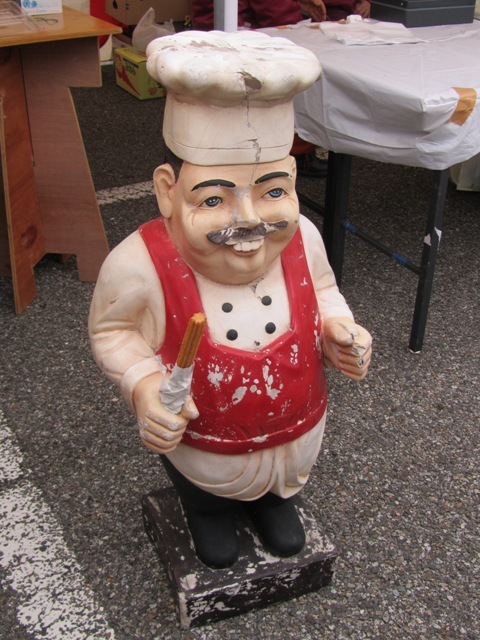 Groups of families or friends gathered around the grills, while festival helpers went around making sure that the fires kept burning. 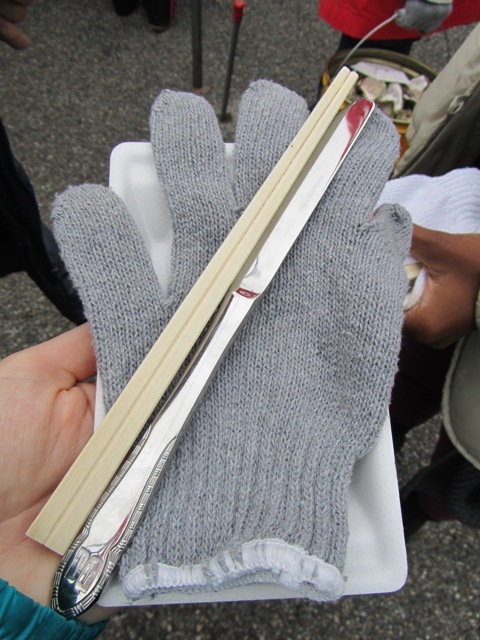 When we had bought our bag of oysters, we were each given a plastic plate, a glove, chopsticks and a knife. 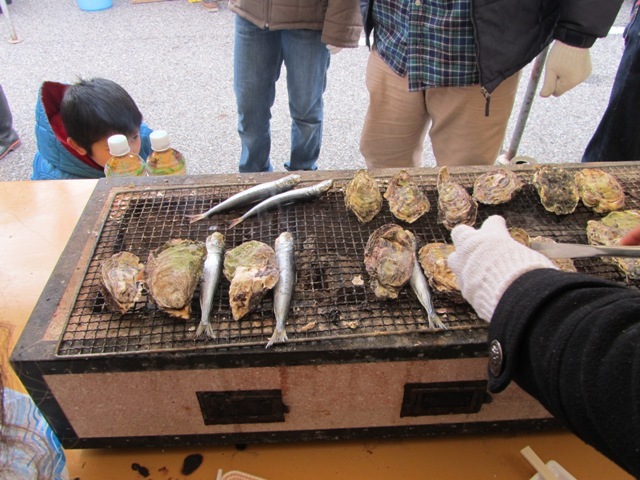 We found a free grill and surreptitiously tried to copy how the other people were grilling their oysters. 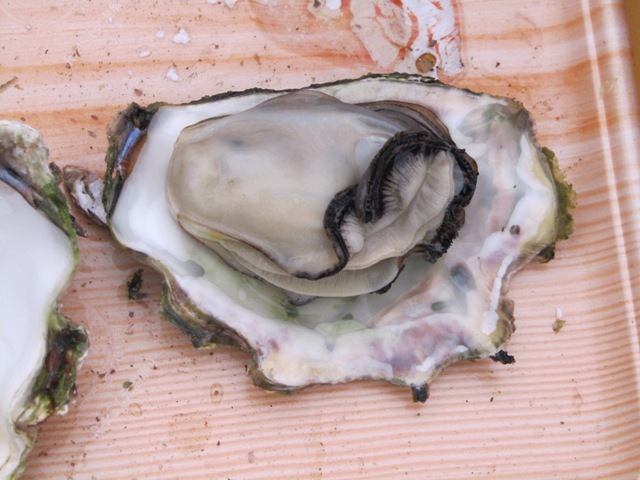 The oysters are still alive when you buy them so their shells are tightly closed, but they open when they’re cooked. It can be a bit dangerous though, as some of the stubborn ones won’t open until finally they explode and you have to be careful not to get burned by oyster juice. 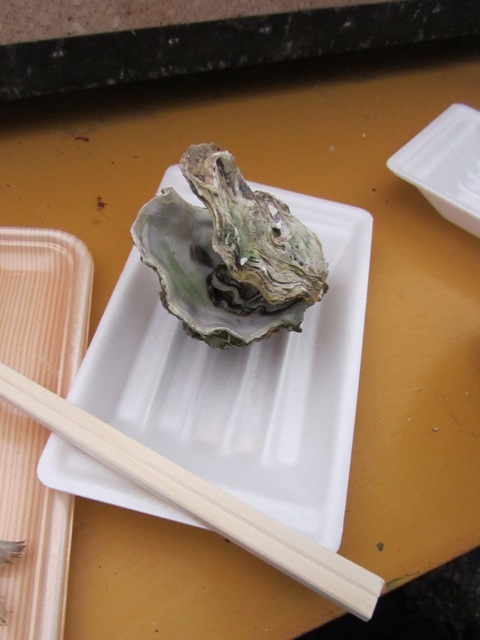 We had forgotten to bring any condiments, but that didn’t matter because the oysters were flavoured with sea salt. Later we got some lemon and tabasco for our oysters which were delicious as well. I had known that Guinness and oysters (or mussels) were a specialty of the West of Ireland, so I’ll have to try them the next time I’m over there. The Galway Oyster Festival is held every September as well, and draws large crowds of restaurateurs and oyster connoisseurs from all over the world. When I was home in Dublin during the winter, I visited my favourite museum, the Chester Beatty Library, to see their current exhibition, Costumes Parisiens. It’s running from 11 October 2013 to 30 March 2014, and I would recommend anyone with an interest in fashion or prints to visit the exhibition, or if that’s not possible, to watch the video guides below. Like most exhibitions in the Chester Beatty, admission is FREE. 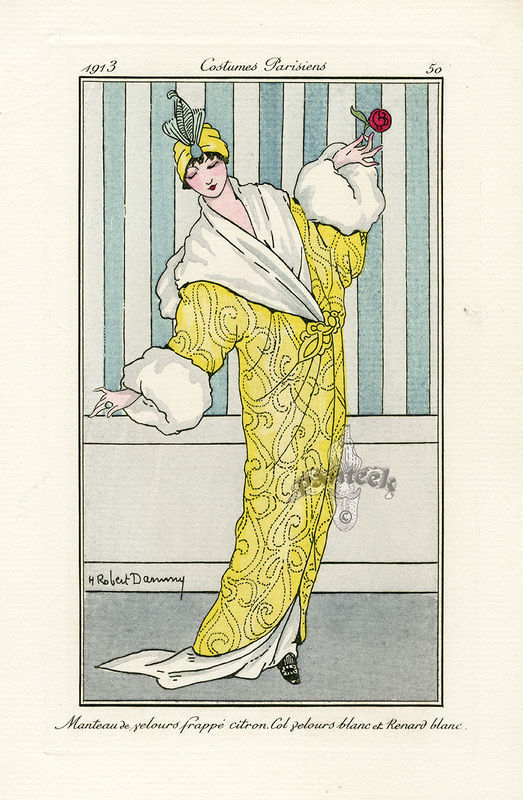 While the majority of objects in the library were collected by Alfred Chester Beatty, we have his wife Edith to thank for this exhibition, as it was she who subscribed to the French fashion magazine Journal des Dames et des Modes, from which the exhibition’s illustrations were taken. 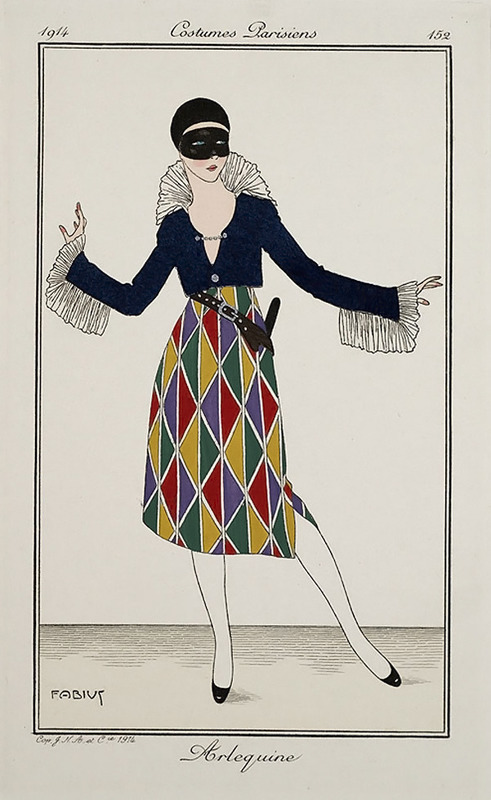 This magazine took its name from a French 19th century fashion magazine, but its reprise was limited to the years 1912-14, until World War I broke out and it had to be discontinued. 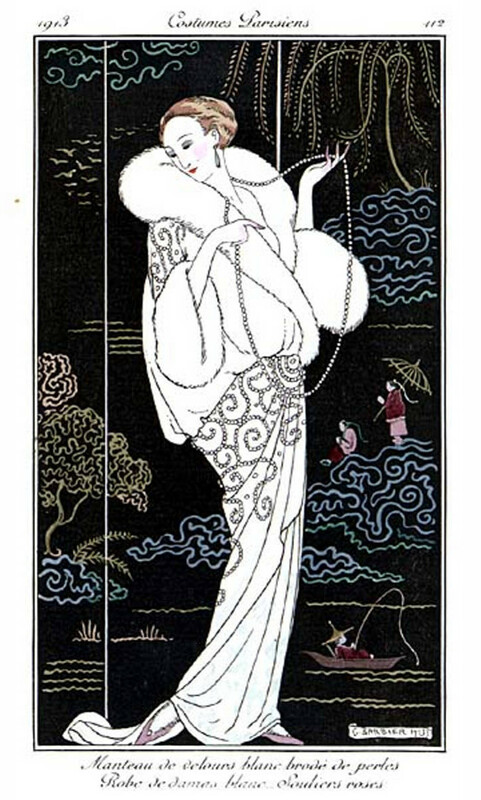 The designs of haute couture were made by master illustrators, such as George Barbier, which were to become a source of inspiration for English middle- and upper-class ladies who wished to keep abreast of the fashions of the continent. 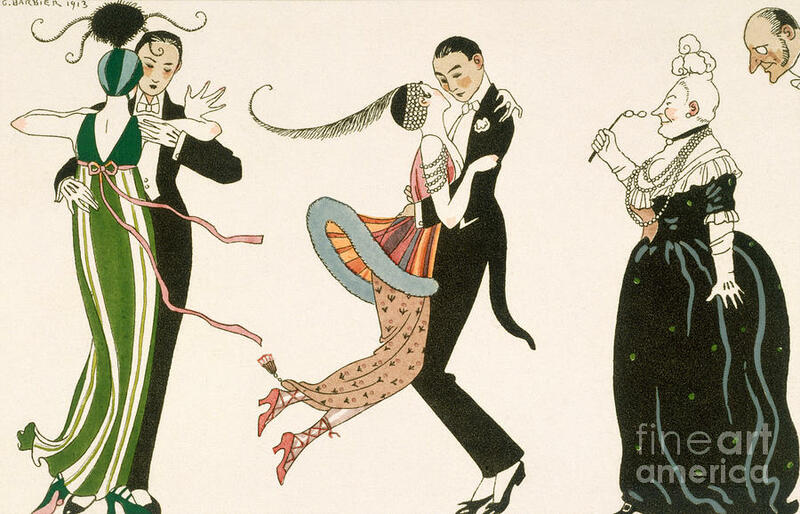 The 1910s are something of a forgotten era in fashion, between the corseted Edwardian era and the flappers of the twenties. 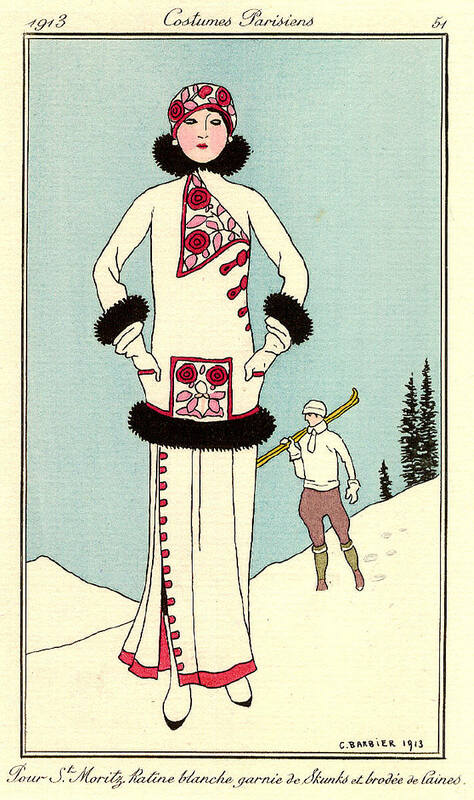 But these illustrations, coming right before the Great War that brought about change in both society and fashion, show that this decade had its own innovations and a different silhouette to the preceding and following decades. Thanks to the popularity of Downton Abbey, whose first season starts with the sinking of the Titanic in 1912, this era has been getting more attention in popular culture. The illustration above shows the difference between the older woman on the right who is still dressed much as she would have been at the end of the 19th century, and the bright young things on the left with their exotic headdresses and slender gowns. The Chester Beatty has an online gallery where you can see the wide range of fashions shown in the exhibition accompanied by excellent descriptions. 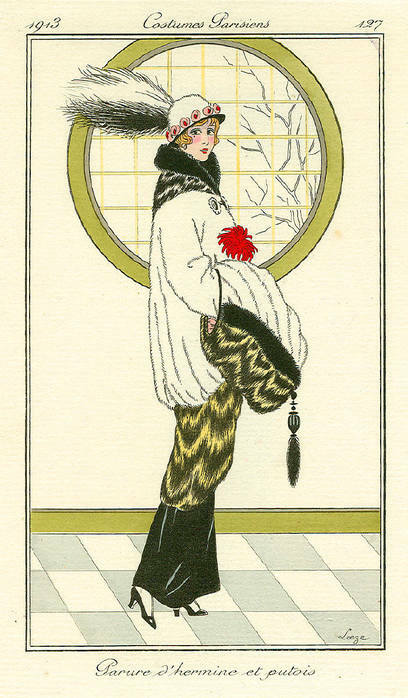 Below I’ve chosen some of my favourites in which you can see the exotic influence of kimono coats, Russian furs, Turkish turbans and Indian patterns. It is a small exhibition, but perfectly sized, because had any more images been displayed, it might have been too much to take in. The beautiful illustrations lining the walls are accompanied by a video of contemporary ladies modelling the clothes, and by a display of original costumes dating from that era, on loan from the National Museums of Northern Ireland. These extra features really bring the designs to life, because the illustrations seem so impossibly elegant that it is difficult to understand or imagine how they would have been worn. Below is an interview with the curator of the exhibition who has a great insight into the history behind this magazine.